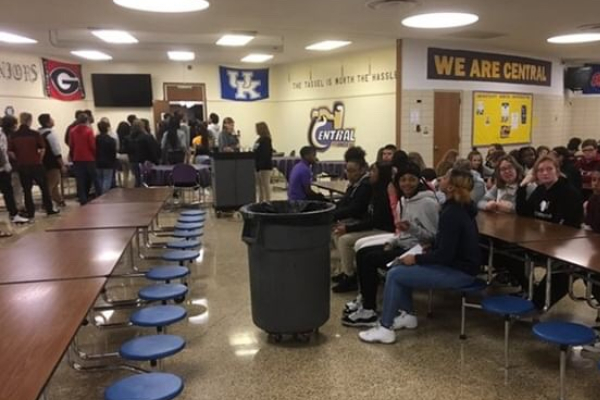 HUNTER AND BROWN MIDDLE SCHOOLS TOUR CENTRAL HIGH-- Eighth grade Brown Middle School students in the cafeteria, waiting to tour the campus. Shadow Day for rising freshmen is an important day for all eighth graders preparing for their high school years. Every year, students from surrounding middle schools, such as Hunter and Brown Middle, come and tour Central High to see all it has to offer. It gives them a peek into high school life and all they could potentially participate in. Seniors of Central High School guided the students through the Central hallways, painting a picture of what high school life may look like within these walls. These future Purple Pounders arrived to the school at about 7:30. Principal Finley King welcomed the students to Central and Mrs. Atkins, the ninth grade guidance counselor, spoke to them about classes and the campus. Later on, the Central High Choir performed for them in the cafeteria. The grade was divided into two groups; one group proceeded to the library where they filled out registration papers and listened to presentations from several classes. The Central Digest, JROTC, and the Engineering Class all had things to demonstrate. Meanwhile, the other group, which was divided into even smaller groups, explored the school with their tour guides. Central staff was also able to speak to the upcoming students. Football Head Coach Jones, for example, talked about Central High football and Mrs. Alexander, Central’s college advisor, talked to them about their upcoming freshman year. “My favorite part about Shadow Day is seeing all of the upcoming ninth grade students beginning to feel more comfortable with high school,” stated Senior Laurelie Holmberg. The overall goal with this visit was to let students know about Central. As well as seeing all the options of classes they are able to take as upcoming students; from seeing what classes they may take, to looking at extracurricular activities they may take a part of, it all helps them decide what route they want to take in high school. “This gives future students knowledge of what types of classes we offer before they choose to sign up,” commented Mrs. Atkins. This opportunity is to help the upcoming students and to excite students for what is to come. “I am now less nervous and pretty excited! 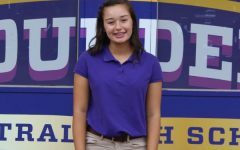 I know now what high school is going to look like, so it’s not just a figment of my imagination,” concluded Brown Middle School student, Alyssa McGhee.